8 oz 22ppm Silver Solution. Nano manufacturing process . . . Through years of testing and work the American Biotech Labs team has been able to develop and patent a manufacturing process that created a much more stable silver product. This new silver technology created an engineered silver nano particle making it the best silver product ever created. Scientists from all over the world have been testing and validating American Biotech Labs products. American Biotech Labs was granted manufacturing patents in 2001 and 2004 with numerous patents currently pending. Other ingredients: Deionized (distilled) Water. Adults: 1 teaspoon up to 3 times daily. Increase as needed or desired. Best if taken one hour before or after eating. This product has a 2 year shelf life from date of manufacture. consult a healthcare professional before using this product. 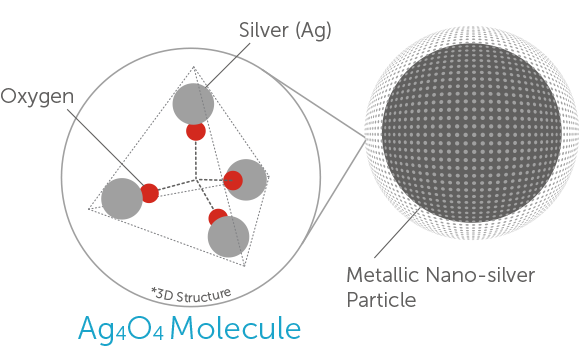 Ag404 MOLECULE: A thin multivalent silver oxide coating, built of numerous Ag404 molecules, surrounds the metallic nano sized silver core. MORE STABLE AND BIOAVAILABLE: With the Ag404 coating, the nano silver particle is attracted to the surrounding water molecules, and as such, becomes part of the structure of the water. This makes the silver much more stable and bioavailable than other forms of silver. MULTIPLE MODES OF ACTION: Testing has uncovered multiple modes of action by which the Metallic Nano-silver Particle functions. First, it has an ability to steal multiple electrons (compared to ionic silvers which can only steal one). Second, each particle is permanently embedded with a resonant frequency, which allows the particles to have a positive effect on things, without needing direct contact with them. Lastly, the particles also utilize a very useful electrostatic charge. Best silver I have ever purchased. I will continue to buy. No after taste. My health is protected. My son is severely epileptic to the point he was having 30+ seizures a day. I have been giving him this and he hasn't had a seizure since. Its been about a month since the last seizure. I give him 6 drops 3 times a day. He did have 1 seizure the first two days we started him on it. The pharmacy ran out of two outta 5 of his seizure medications and he's never been able to even be late on a seizure medication in over two yrs. The pharmacy still doesn't have his medications in and its been 5 days and he can't even be 5 min late on a medication ever.. so this is a big deal. He's 12 yrs old, non verbal, and has autism, he is eating which is huge because he lost weight from having to many seizures and he's back to my happy cuddly boy that I missed so much. Originally bought this to help with a sinus infection that 3 rounds of antibiotics would not kill. Worked in 3 days of spraying and ingesting. Since then, here are all the things it has worked for: Spraying skin under lotion for eczema healing, kids sniffles and colds, scratches in eye and eye irritations, ear lobe earring infection. Its just amazing stuff. Have used the ASAP Silver Products for several years. First the 10 ppm and now the 22ppm. These products replace my ineffective antibiotics, helped clear up my 'incurable' infection, helps keep away bacteria and viruses. I use the ASAP products to gargle, ingest, brush my teeth, use on skin rash, and more. Powerful Stuff, and Natural. There are many nano silver products out there, and I am sure they are good. I have used some of them. But the science behind this product convinced me of the quality. (I found a pdf once, but am looking again for that explanation pdf!) I use this frequently, and it is a really good addition to my repertoire of good holistic products. And the price is fair too. Recommendation: buy it directly from this site. Silver Solution USA ships about as fast as the BIG online shopping site that requires a membership to get 2 day shipping. And when I order from Silver Solution USA, I know it is the real thing, and not a knockoff. Hope this helps! I learned about this ASAP SILVER from a very well known surgeon in Las Vegas. He would put a teaspoon full in his mouth before he would enter the hospital. He said, he did this for many years to avoid getting sick from all of the bad bacteria he encountered. I drink it daily and I'm never sick. If I'm run down n feel a sore throat coming on, I gargle with it and swallow it and next day I feel great. I have had 2 very ugly warts under 2 of my fingernails for several years. Have had them burnt off (very painful afterwards) & they returned as I was told by Dr they probably would. I started taking silver solution internally several times a day & also spraying it directly on them several times a day. They are slowly beginning to wither away & hopefully will completely disappear in a short time. I plan to always have a bottle & a spare on hand. Due to back-to-back surgeries, I was afraid to continue using this product while "preparing for and going through" the operations. I didn't want my doctor to look at me crazy because I was strictly told not to use ANY supplements. Worse decision ever. I got an infection in my throat from the breathing tube! I was in a ball of pain from my stomach procedure....and after 4 days of barely being able to swallow applesauce, I decided to take 2 tablespoons. I fell asleep and woke up 100% ok!! I was able to eat and my stomach felt a lot better. Bottom line, it works! It has kept my fever at bay from the infection. I didn't get my normal yeast infection from the anti-biotics --- which is a first! I think this is one product I will ALWAYS have on me!! !